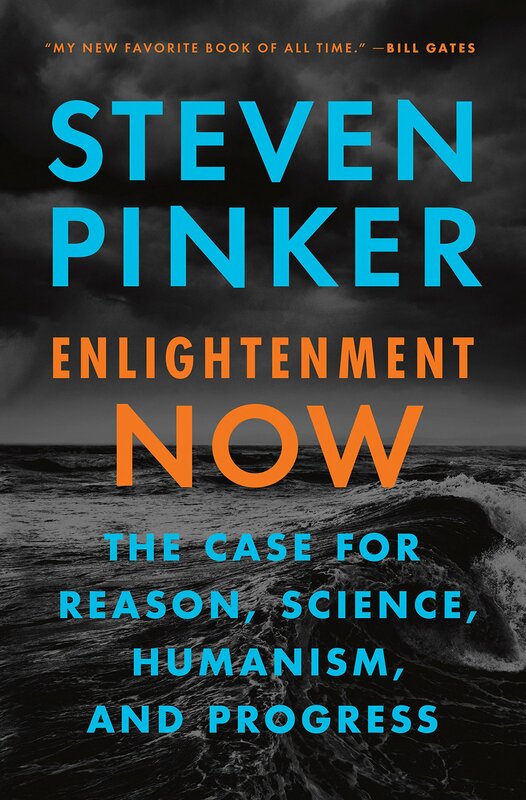 I’ve recently finished what quickly became my favorite book of all time: Enlightenment Now by Steven Pinker. Pinker is an intellectual powerhouse, and he is astoundingly good at using data to undercut widely held presumptions and intuitions. One of those presumptions, remarkably common, is that the world is becoming more and more dangerous. Instead, Pinker argues persuasively, the world is becoming more peaceful, less impoverished, less diseased, more liberal, more tolerant, and more progressive, year after year. It’s tempting to think otherwise. Ideologues on the left and right want to recruit you to their faction by convincing you that things are bad, really bad, and the only way to fix them is to join them in a war for justice. The 24/7 news cycle primes us to be hypervigilant about crime, even though it’s been in decline for decades. We think wars and terrorist attacks could occur at any moment, but they’ve been going down, down, down, for a very long time. In short, Pinker will convince you that the world is a better place than ever, despite the fear of impending doom. I have no doubt that all of this is true. As counterintuitive as it may be, you can’t deny the data, and Pinker will hammer it into you whether you like it or not. But what about animals? Has the world gotten better for them, too? One of Pinker’s main arguments is that science and reason are one of the ways that all of this progress has been possible. The world is more peaceful than it used to be because we humans learned to cooperate, not only with those like us but with those unlike us. We’ve developed a pro-social society — sensible from even a selfish evolutionary perspective — because we are all better off when we work together, whether in the form of trade or simply not killing each other, than when we predate on others. And we’ve developed a pro-social world, made up of pro-social societies interacting with one another. This expanding circle of interaction and cooperation has been made possible by, or perhaps resulted in, an expanding circle of concern. As globalization has increasingly connected all corners of the Earth, we’ve been able to see that those in other hemispheres are more like us than they are different. We are interested in keeping them alive because we’d want them to help us if we’re ever in danger. Pinker tracks the expanding circle — a term coined by Peter Singer — from tribes, to countries, to all humans, all the way to animals and the planet. As we’ve begun to sort out that which causes suffering to fellow man, including starvation, corrupt governments, droughts, natural disasters, and so on, we’ve also begun to look elsewhere for a continuation of moral progress. That includes animals. No one really cared about animal rights a hundred years ago — there wasn’t a term for vegetarianism, never mind veganism, back then. But once women got the right to vote, segregation of races was eliminated, and the tide turned against war, we began to really consider the plight of nonhumans. Pinker is optimistic about the direction we’re heading with regard to animals. Though I don’t recall him making any predictions about a vegan or vegetarian world, he seems convinced that the world will get better for animals, too, as we learn to consider their interests. However, I wonder if Pinker’s data on the world becoming more peaceful is counteracted by an increase in the raising of animals for food. While most of Pinker’s data on violence is proportional — the only sensible way to measure it due to the population explosion — I suspect that livestock deaths even as a proportion would show an increase over time, since meat consumption has increased over time. And animal cruelty laws have explicit exemptions for animals raised for food, so cows, pigs, and chickens have largely missed out on the narrative of moral progress that takes pets into account. Furthermore, the conditions in which animals are raised has probably gotten worse, though there’s no way to be sure. So-called “factory farms” have become the norm, as supposedly “humane” small farms have provided a smaller and smaller portion of the meat supply. So not only has the number of animals killed for food increased over time, their treatment has gotten worse. If we take the treatment of animals into account, we may not actually see a decrease of violence — if we categorize it as such — over time. We may, in fact, see an increase, if we create some sort of unit of suffering for each species of animal and multiply it by the number of members of that species slaughtered per yer. This isn’t to discount Pinker’s work. He’s undoubtedly right about the decline of violence and the indisputable progress we’ve made. But all of this may be strictly in the human real, and we shouldn’t overlook the suffering of animals. If we’re to expand our circle of compassion to include nonhuman animals — and not just those we cuddle with — we should do so soon.